On this the final day of the Fringe and having completed my reviewing schedule a few days ago, on something of a whim, I shed my reviewer’s lanyard and bought a bundle of tickets, some from the Half Price Hut. I began at the Pleasance Courtyard with Gael Le Cornec’s portrayal of artist and model Camille Claudel – a beautiful and moving performance capturing the mood of the Parisian art world during the final years of the 19th century. Then, it was off to the Gilded Balloon for the remainder of the day. Rob Crouch as Oliver Reed is spot on as the hard drinking, charismatic actor. The next two shows have been fully reviewed elsewhere on this site. 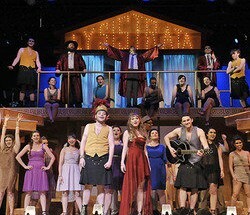 Bad Musical is a delightfully silly and very funny send up of Musicals. Finally, Celia Pacquola is a comedienne whom I have seen before and I thoroughly enjoy her style of warm ‘feel good’, conversational humour. Four contrasting shows to round off a most enjoyable Fringe.